Delhi Capitals won the previous face-off in the super over. The only super over of this Indian Premier League (IPL) season has been played between the Delhi Capitals (DC) and Kolkata Knight Riders (KKR). The game was at the Ferozshah Kotla then and the return fixture is all set to be played at the Eden Gardens in Kolkata. It will be another run-fest for sure and most importantly, the KKR will be feeling relieved after finally coming back home. They were on the road for the last four matches and returned with only a couple of victories. But with the next three matches to be played at home, they will be looking to add more points to their tally. Having said that, the team’s batting has been poor, to say the least, this season. Only Andre Russell has been remarkably consistent and it was his half-century which took them past the 100-run mark against the CSK. Also, he has been the match-winner for them in three out of four wins so far this season. Other batsmen will have to step up at any cost with the tournament moving ahead fast now and every game becomes extremely important. As far as DC are concerned, they won against the Royal Challengers Bangalore (RCB) and will be looking to be consistent. They have a couple of injury issues but that shouldn’t affect the team combination as of now. They have strangely got into the habit of imploding from winning position and that cost them the game against the KKR last time around. However, Kagiso Rabada‘s exceptional super over helped them win the encounter. DC would love to make it 2-0 this seasons against the KKR. The 22 yards at the Eden Gardens has been the graveyard for the bowlers in this season. The first innings score in the two matches thus far are 181 and 218. It should be another high-scoring game and chasing will be preferred with the small boundaries on offer. An afternoon thunderstorm is in the forecast in Kolkata on Friday. But the clouds will clear by the time the match starts. There has been an injury concern with Andre Russell. He was in extreme pain in the previous game while batting. Though he fielded later in the game, the KKR team management might not want to risk his season and rest him. In that case, Carlos Brathwaite will get his first opportunity in KKR jersey. Rest of the team should be the same. Probable XI: Chris Lynn, Sunil Narine, Robin Uthappa, Nitish Rana, Dinesh Karthik ( c & wk), Shubman Gill, Andre Russell/Carlos Brathwaite, Piyush Chawla, Kuldeep Yadav, Prasidh Krishna, Harry Gurney. There have been reports of Rahul Tewatia being ruled out of the tournament due to injury. But the franchise hasn’t confirmed anything. If he is actually injured, then Amit Mishra will most probably replace him in the XI. The rest of the team is actually doing fine and will be focusing on playing the same brand of cricket. 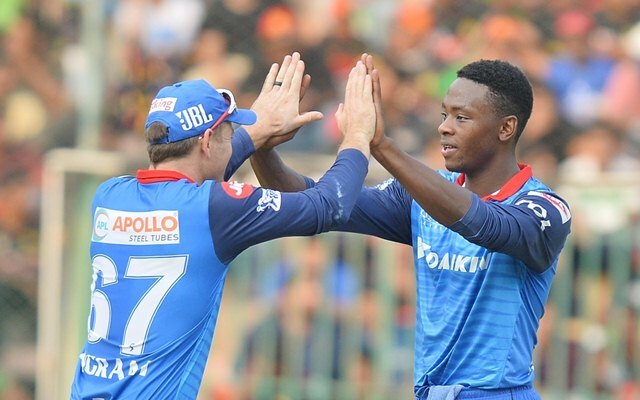 Probable XI: Prithvi Shaw, Shikhar Dhawan, Shreyas Iyer (c), Colin Ingram, Rishabh Pant (wk), Chris Morris, Axar Patel, Kagiso Rabada, Amit Mishra, Ishant Sharma, Sandeep Lamichhane. 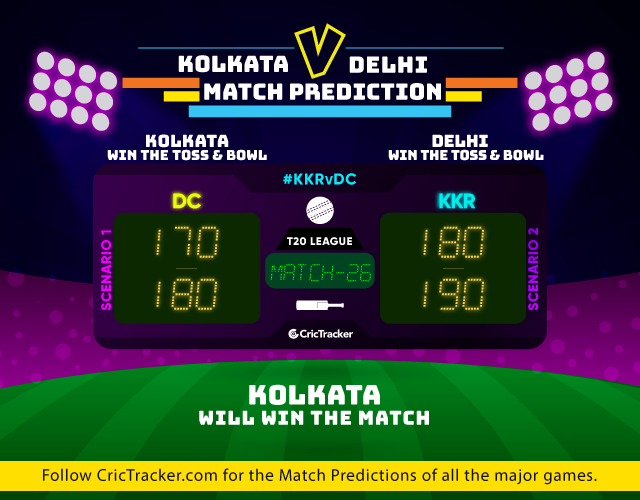 The prediction is for the KKR to win the match and settle the scores with DC.